My dad loves to do too many projects all at once. He loves doing different types of DIY projects, handicrafts and even artsy stuff. That is why our place has too many handicraft materials, handyman supplies and many others. What I hate about it is the fact that he is having a hard time using too many tools at the same time. He has too many tools already: a hammer, set of screws, a set of knives, pieces of clamps, nail claws and many others. He doesn’t use all of them, just the basic ones for his projects. I’m really sad that his stuff looks like a mess whenever he’s looking for a specific tool for his project. Too many handyman supplies in one piece! This multifunctional tool can be used as a pliers, hammer,nail claw, small/large knife, nail file, serrated blade, wire cutter, phillips/slotted screwdriver and a bottle opener. 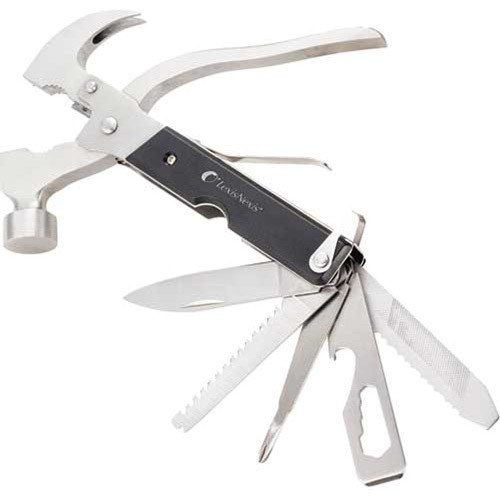 This amazing tool looks durable too for it’s made of stainless steel. Because of its compact and sleek design, it is guaranteed to last for a long time. And since it’s my dad’s birthday in a few days, I decided to buy this amazing product in the MetroDeal website. Went to the actual deal and click on the “buy now button”. I’ve never been so estatic before on my purchases online until today. After all, this one’s for my papa dearest. Few weeks after I bought this deal, I finally got the handy handy hammer tool at our doorstep. Oh how I love how durable the product is and the quality is great, it makes me think that it’s all worth it. And I only got this for only 299 pesos, it’s a real deal for me. Helpful gadget friendly price = real deal. As I handed this to my papa, he was happy and surprised that I got this from him. He adores the handy hammer tool to bits! Daddy used the gift that I gave to him the next day on his next handyman project and the tool never left his side ever since. I’m thrilled that dad loves this. I am one happy customer, MetroDeal has been a great help in having handy and innovative products being posted in their site. Hope that I could see more deals like this in their site soon! This entry was posted in Reviews and tagged handy hammer tool, metrodeal, metrodeal reviews. Bookmark the permalink.